The Bedford Speedway and The Greater Cumberland Raceway begin their 2019 schedules this weekend, but Brian Lowery Racing will not be in attendance as the team continues to prepare for the season. "The business (BSL Racing Graphix) has been extremely busy combined with work and things coming together slowly with the car, we just aren't fully prepared to go to the track this weekend. If all goes well, I'm hoping we can start things off next weekend," says team owner/driver Brian Lowery. BLR tentatively plans to have the 2019 version of the #13 Mopar on track at the Bedford Speedway April 19th. The 2018 season came to a coasting halt Friday night at the Bedford Speedway for BLR as the engine failed in the #13 Dodge while Brian Lowery was out to a commanding lead in the heat race. "We've just had some rotten luck this season and this tops it all off, that was our only bullet and we'll have to get it apart and diagnose what happened and start building for next year," said Lowery. Stay up to date with Brian Lowery Racing with the latest news and announcements on the Brian Lowery Racing Facebook page and www.brianlowery.com. The Bedford Speedway won against Mother Nature under threatening skies all evening and got the complete "Sunday Funday" show in as scheduled. Brian Lowery Racing was hoping to build on some of its recent success, but had to settle for a 10th Place Finish after starting 14th. "The result may not show it, but I think we made some progress on the chassis tonight. We passed some cars but never got any cautions to help us group back up, but I'm happy that the car responded well to some changes we made. We'll put together a plan for Friday and with any luck we can get a better finish," said Lowery. BLR will be back in action with the Mason Dixon Shootout Series this Friday at the Bedford Speedway. Brian Lowery brought the Curry Dynamics powered Mopar home with a 2nd Place finish at the Greater Cumberland Raceway after starting 5th. "It was a pretty good run tonight for us, we started off a bit in the hot laps but the crew worked hard and we made some good changes to the chassis tonight to adapt. Feels good to put together two decent runs and build some momentum," said Lowery. Team #13 will be back in action Friday at the Bedford Speedway. Brian Lowery battled some handling issues for most of the Feature Race at the 145th Annual Bedford County Fair Race, but managed to bring home the Curry Dynamics MOPAR powered Rocket Chassis with a 6th place finish after starting 14th. "We've got a couple things we need to work on with this new car and we keep trying stuff each race, hopefully we find the missing link soon," said Lowery. Team #13 will be back in action tomorrow night at the Greater Cumberland Raceway. The Mason Dixon Shootout Series invaded the Bedford Speedway on Sunday bringing the best Late Model Sportsman drivers in the area into town. Coming off of last weekends Feature Win at the Cumberland Raceway, Brian Lowery and Team #13 was hoping to ride the momentum to a good finish against the Shootout Series regulars. After starting deep in the heat race, Lowery advanced to a 6th place finish. The Team #13 Curry Dynamics powered Mopar rolled off from the 14th position in the 25 lap Feature race. In the first third of the race Lowery seemed to have a good handle on the very slick Bedford track surface and climbed up to the 8th position by lap 8. However things changed throughout the race and the handle went away and Lowery brought the car home to a 12th place finish. "Thought we had a chance at a top 5 there for awhile, we were coming in a hurry and it just went away. I think we let the tires seal over on a caution and I couldn't get them back, but on the bright side we finished and the car is in one piece and we'll make it better," said Lowery. It took nearly half of the 2018 season for Brian Lowery to finish a race, but he made it count Saturday night at the Cumberland Raceway with a dominating victory. The evening started with a Heat race Win after starting 3rd with the Team #13 Dodge. For the Feature Race, Lowery rolled off from the pole position and led every lap enroute to his first win of the season. "Feels great to finally put together a complete effort and show what this Mopar is capable of doing. Gotta thank all the sponsors for the support and sticking behind through the rough times. I knew we had a good handling Rocket Chassis from week one, but we had so much bad luck and troubles to work through. Really wanna thank Todd Bechtel at Curry Dynamics for all his hard work on a great engine and helping us get through some of our issues and Mike Lutz at Genesis Racing Shocks for all his help and products," said Lowery after the race. Team #13 would also like to thank all the supporters that make this possible: Stuart Shaffer Trucking & Excavating, BSL Racing Graphix Racewraps, Karissa's Hair Hut, Hyndman Area Health Center, Curry Dynamics, Gerald Corle Hoosier Tires, Roger Lowery Racing, T.G. Motor Sales, Rocket Chassis, Genesis Shocks, & TC Race Cars. With a much needed break from Mother Nature, Team #13 made the Sunday trip to the Bedford Speedway looking for a solid finish only to have Lady Luck strike misfortune once again. During early action in the Heat Race, the oil pump belt broke causing engine damage to the #13 Mopar. "We just can't shake this bad luck, but we'll keep trying, it's gotta end soon. I just gotta thank everyone who helps me out with this, cause it gets frustrating, but it's what we do and we'll keep digging. We'll get it torn apart tomorrow and start assessing the damage to see what we need to do for getting it back on track," said Lowery. Team #13 had another poor outing tonight at the Cumberland Raceway. Lowery started 2nd in the Heat race and slowed to a 4th Place finish citing mechanical issues as the problem. The Team tried to quickly diagnose the problem before the Feature event, but to no avail. Lowery rolled off 8th for the Feature, but was hampered again by the same issue and pulled pit side by the halfway point. "We've got something going on but not sure what, we don't know if its in the engine or fuel or something else. We'll have to get it back to the shop and try to figure it out," said Lowery. Last nights Bedford Speedway season opener took a turn for the worse on the first lap of the heat race as the #13 Mopar of Brian Lowery got tangled in a accident that left the car wounded for the night. "It's unfortunate to get caught up in someone else's mess like that, but it's racing and you have that. We were in the wrong place at the wrong time," said a disappointed Lowery after the races. "On the bright side, I think the car and engine were the best I've ever had in the hot lap session. Gotta thank Todd Bechtel for all his hard work on the engine, Rocket Chassis and Genesis Shocks for the car and chassis setup. We'll get this thing fixed up and I believe we have some real bright days ahead of us," said Lowery. 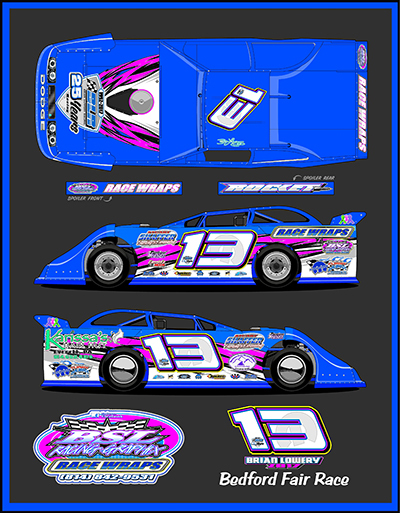 Brian Lowery Racing will compete again in the Late Model Sportsman division in 2018 with the familiar number 13 MOPAR engine powered Rocket Chassis. BLR plans to compete regularly at the Bedford Speedway and the Greater Cumberland Raceway which includes 5 dates with the Mason Dixon Shootout Series. Also highlighted on the schedule for BLR is the Annual Bedford County Fair race on July 22, Bedford Speedway Fall Fest on September 15, Bedford Keystone Cup on September 29, and the Queen City 50 at the Greater Cumberland Raceway on October 19 and 20. Brian Lowery Racing is working hard completing assembly of a new Rocket Chassis with a refreshed paint scheme for 2018. BLR will once again rely on a MOPAR powerplant built by Curry Dynamics who is equally as busy preparing for the upcoming season. "Todd (Curry Dynamics) has always done a nice job for us. He seems to be really excited with what is going on over there with the engine side of things and I'm excited about the new chassis, when it all comes together it should be one of the best pieces we've ever put on the track. We are once again utilizing Genesis Shocks and working with them to get the power to the ground and chassis heading in the right direction. With the ever changing technology in dirt late models, its nice to have some factory support from Genesis to lean on when needed." Visit www.brianlowery.com often to keep up with all the team news and scheduling. Brian Lowery and Team #13 has finished up their 25th season in racing and work has already begun for the 2018 season. "Unfortunately we broke our engine a couple weeks ago at Bedford and won't make it out to any more races this season. We are already planning to get the engine program started and also have begun work on a new chassis for next season too. We did get a feature win at Cumberland and had a strong run going at Bedford the last race, but we struggled with the handle on the car for the most part of this season. We definitely took a step backwards in performance from last season, so we'll try to figure out what we need to do to get that Mopar back up front for next season," says Lowery. Keep up to date with all BLR news and plans for next season when it becomes available on the teams website www.brianlowery.com or the Brian Lowery Racing Team facebook page. It was a beautiful summer evening for racing at the Bedford Speedway, and Team #13 took to the Bedford Speedway to take on the Mason Dixon Shootout Series. The night started off well for Team #13 as Lowery piloted the Curry Dynamics powered Mopar to a runner up finish in the Heat Race. Lowery started the 25 lap Feature race from the 5th starting spot, but didn't stay there long as the chassis didn't appear to his liking and eventually settled for a 9th Place finish. "The car was better than the driver tonight. I tried to work the bottom of the track for the first third of the race and should've went to the top. Got to far behind, I think we could have hung there a little better if I would've," said Lowery after the race. Brian Lowery and Team #13 have the week off from racing action, but are using the week to prepare for the prestigious Bedford County Fair Race at the Hyndman, PA shop. "We always like to take this week to kind of put some extra effort into the prep and maintenance for the fair race, it's always a huge turnout and we like to run good and look good for the crowd," says Lowery. In 2015, Lowery was able to break through and get his first Bedford County Fair Race Feature win and considers it one of his biggest wins to date. The Late Model Sportsman edition of the Bedford County Fair Race is Sunday July 23rd. Also big news this week is the Brian Lowery Racing Team has added a new marketing partner with the Hyndman Area Health Center. The Hyndman Area Health Center (HAHC) has a mission to provide quality health and dental care at a comfortable, attractive facility in a cost effective manner. The HAHC now has two locations, Hyndman and Bedford, that are staffed with caring, knowledgeable, and qualified personnel. The Brian Lowery Racing 25th Season #13 Dodge Challenger will have a slightly different look when it rolls out for the Bedford County Fair race this week. Along with the Hyndman Area Health Center logos, the car will feature another new 2017 marketing partner Karissa's Hair Hut. "We are excited to be able to help promote these two new partners, anytime you can introduce new businesses and people to the sport is a great thing. There is not a better opportunity to promote the new people than the Fair race, its one of biggest turnouts of the season, hopefully the weather decides to cooperate," says Lowery. Team #13 made its first start of the season with the Mason Dixon Shootout Series during its stop at the Bedford Speedway for the "Independence Day Face-Off" on Sunday night. Thirty-one cars entered the Bedford Speedway pit area to battle it out for the 4th of July Weekend special event. Things began well as Lowery cruised to an impressive heat race win with his Curry Dynamics powered Mopar Dodge Challenger. For the 25 lap main event, Lowery rolled off from the 2nd starting position, but it was evident early that he didn't have the car performing to his liking and fell to a 8th place finish. "We were fast early, but not when it really counted. We've been off so far this year at Bedford, getting closer though. We were so good in the heat that we didn't change enough for the feature and it really bit us. It was really fun to compete with the Mason Dixon Shootout Series, they have some top notch competition and is run really well," said Lowery after the race. Team 13 will be back in action this Saturday at the Greater Cumberland Raceway. Things started well with a dominating Heat race win for Team #13 last night at the Cumberland Raceway. After the invert, Lowery started 6th in the Feature event and quickly worked his way to 2nd place. Lowery was able to use his Curry Dynamics Mopar power to catch leader Curtis Heath and was looking to the inside of him when a caution occurred for a spin. On the restart Lowery again looked to the inside of Heath for the lead, made slight contact and decided to back out when he was then hit in the LR and spun. "We got in under Curtis coming off turn 2 and it got tight so, I got off the throttle and the K20 had nowhere to go so he got into me. It was a racing deal, I just wish we could have all finished to put on a good show for the fans. We were fast and had a car that could win, so we gotta feel good about that." said Lowery after the race. After 3 straight rainouts due to the regions wet spring, the Brian Lowery Racing Team was eager to get their 25th season back on track Friday night at the Bedford Speedway. Lowery started 7th in his heat race and improved to a 5th place finish. For the Feature race, Lowery rolled off from the 10th position in the Curry Dynamics Mopar powered Dodge Challenger. After fighting an ill-handling car, Lowery brought the car home with a 9th Place finish. "We were behind from hot laps on tonight. We just never adjusted enough all night long, should have taken a bigger swing at it. We brought it home in one piece and can work on it for the next time," said Lowery after the race. Things started off rough for Team #13 this weekend at the Bedford Speedway. After constantly posting lap times faster than the Late Model Sportsman Bedford Speedway track record in hot laps, the team thought they had a car to be reckoned with for the night. Brian started 4th in his Heat race and finished 3rd. After redrawing the number 6 for the Feature race Lowery got off to a decent start, but unfortunately got tangled with another competitor early and would end up retiring for the evening. The team worked long hours Friday night and Saturday morning making repairs to the #13 Dodge Challenger Rocket for their first visit of the season to the Cumberland Raceway. Lowery and the Team struggled with the handling of the Rocket chassis early in the evening at Cumberland, but the team went to work and made adjustments. Lowery rolled off on the pole position for the Feature but dropped to 2nd place by the end of lap 1. Throughout the race, Lowery's Dodge Challenger Rocket powered by Curry Dynamics seemed to improve and overtook the lead by halfway and held on for the Feature win. "Really cool to come back here and get a win at Cumberland. I've got to give so much credit to my crew for staying up late last night and all day today making repairs to the car, it made it all worthwhile. This (Cumberland) track was so heavy, we struggled with the car, but the Curry Dynamics Mopar powerplant really bailed us out," said Lowery after the race. TEAM #13 KICKS OFF 25TH SEASON, STUMBLES TO 9TH PLACE FINISH. Brian Lowery and Team#13 kicked off the 2017 season last night at the Bedford Speedway. The night started off well with a 2nd place finish in the heat race. Luck of draw gave Lowery a 5th place starting spot for the Feature race. The BSL Racewrap Dodge Challenger wasn't handling to Lowery's liking and he eventually fell to a 9th place finish. "Well we got the first (race) in and knocked the rust off, now we can get to racing. We had some bugs to deal with and I didn't make some good decisions with the chassis setup, we'll learn and move on," said Lowery. As the race tracks sit quiet in the north east, many race shops are buzzing with lots of work and it's no different at the Hyndman, PA home of Brian Lowery Racing as the team prepares for its 25th Year in competition. The team is busy with the usual off-season routine of maintenance and getting ready for a season long racing schedule. 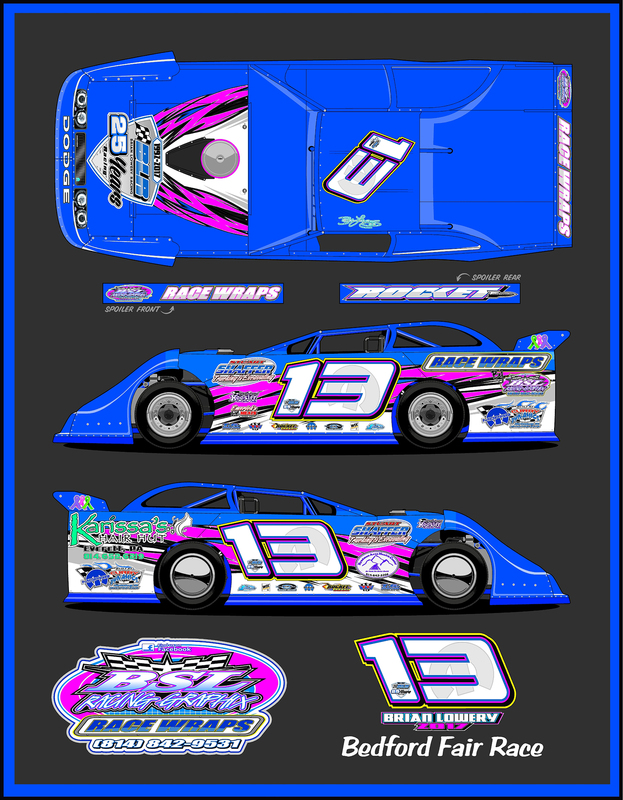 Team #13 will once again be competing in the Late Model Sportsman division in 2017 using a Dodge Challenger bodied Rocket Chassis which is powered by a Curry Dynamics built Mopar engine. The team has just announced it's planned schedule for the upcoming season which includes races at the Bedford Speedway, Hagerstown Speedway, and the Cumberland Raceway. To help celebrate "25 Years In Racing," the team has launched a new website at www.brianlowery.com and also a new facebook page @brianloweryracing. Brian Lowery Racing has just released a brand new Kevin Quirk Racewear designed t-shirt featuring the 25 Years in Racing logo which is available for purchase now at the teams facebook page and will be available all season at the team hauler and shop. TEAM #13 STRUGGLES END; WINS BEDFORDS FALL FEST FINALE! Brian Lowery and Team #13 would like to thank all the sponsors that make it possible to compete every week: BSL Racing Graphix, Curry Dynamics, Hoosier Tires, Rocket Chassis, Stuart Shaffer Trucking/ Excavating, 1st Place Motorsports, Emerick's Meats, T.G. Motor Sales, Genesis Racing Shocks, Corley's Auto, T.C. Race Cars, and WIX Filters. The next event for Brian Lowery and Team #13 will be Saturday, September 17th at the Bedford Speedway for Fall Fest Weekend. The Late Model Sportsman compete on the Saturday portion of the two day event and Lowery hopes to end the Bedford Speedway season on a high note. "We just haven't hit on the right combination for Bedford yet this season. For whatever reason we've just been off, but we're looking forward to Fall Fest and trying to get this Mopar up front," says Lowery.